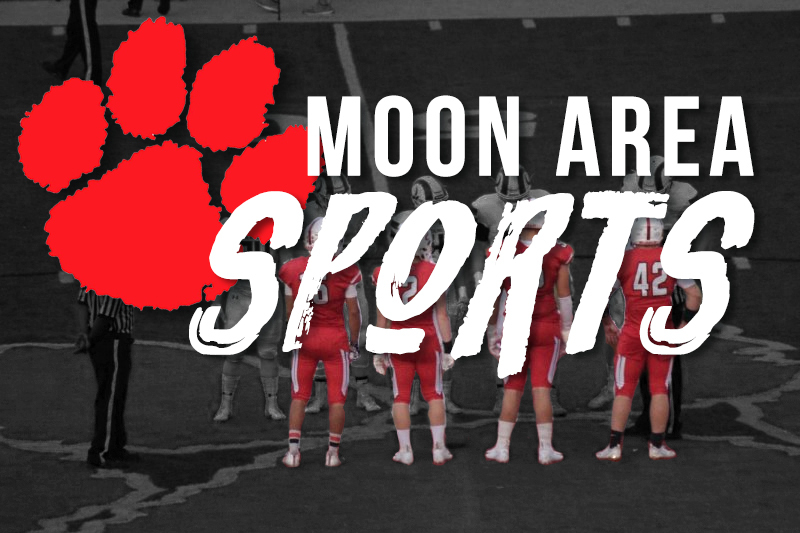 MOON TOWNSHIP — The Moon Tigers (14-0, 7-0) hosted the West Allegheny Indians (5-10, 0-5) in efforts to keep their impressive win streak alive and stay on top of the conference. Moon came out of the gates scalding hot on offense. On the very first possession, Donovan Johnson crashed the boards to gain an offensive rebound and then quickly passed it to the corner where Connor Ryan drained the three ball. A few possessions later, Ryan hit yet another three. Around the halfway mark of the quarter Johnson really took over the game. Johnson scored six points in under a minute all from heavily contested shots. Moon’s offense continued to dominate and amassed a 14-0 run before it was broken by a fade-away jumper from the Indians. Moon’s defense was just as, if not, more impressive than their offense. The Indians did not score a single point until the three-minute mark, which would be their only points in the quarter. The first quarter ended with a 7-0 run led by Johnson and the Ryan twins. Moon ended the first quarter on top, 21-2. The second quarter began with an uncontested layup for the Indians. However, after stellar defense from Johnson and Jionni Smith, the Tigers exploded for a 10-0 run with threes from both Johnson and Tre Carter. The quarter ended with a little bit of a back and forth as West Allegheny scored seven and Moon scored six in the closing minutes. Moon still had the lead at halftime, 37-11. After halftime, Moon remained on fire going on an 12-0 run after Johnson hit two threes with a euro-step layup and Ryan made a reverse layup to go along with an elbow jumper. Smith’s defense was a force to be reckoned with in the third quarter. He had five steals in the quarter and a block that was sent into the stands. Smith ended the game with seven steals total. In the waning minutes of the quarter, Johnson added insult to injury off a fast break where he threw down a dunk with nobody around him. Moon extended its lead even further in the quarter commanding a 61-22 tally. The fourth quarter consisted of both teams younger players getting some action. For Moon, Connor Graham played very well. Graham shot 100% from the field and ended the night with eight points. This quarter was not filled with the excitement of the other three as West Allegheny scored eight opposed to Moon’s 10. Moon came out with a very impressive win over a team they only beat by less than 10 in the previous match-up. The final score was 71-28. The Tigers looked unstoppable tonight. If the Tigers play like this during the playoffs, it’s going to be very hard for any team to stop them. Moon will travel to West Mifflin on Tuesday to face the Titan (2-10, 0-2) in a non-conference game.